What changes will make the 2020 Mazda 6 different? Probably very little because Mazda gave its midsize sedan a significant refresh for model-year 2018. We might see some trim level and/or feature tweaks to the 2020 Mazda 6, but nothing really worth waiting for. Actually, the crystal ball is a bit hazy for this high-fashion, front-wheel-drive four-door. That’s because the 2019 Mazda 6 isn’t scheduled to hit dealerships until April 2019. It’s valid to ask why Mazda doesn’t simply skip model-year ’19 and jump into 2020. Perhaps it’s because the 2018 6 is still in good supply. Plenty were in stock as of February 2019, and dealers were offering surprisingly generous discounts. Frankly, this relatively small Japanese automaker is unlikely to make major near-future investments in the 6, a car with sales near the bottom of its competitive set. Demand fell 7.4 percent for calendar 2018 – in a class where sales were off a full 13 percent. Indeed, the market’s rush to crossovers and SUVs has hit midsize sedans especially hard, a particular shame in the case of the 6, a segment benchmark for style and driving dynamics. Note that driving impressions and other subjective conclusions in this review are based on road tests of the 2018 Mazda 6. In areas where the ’20 might be different, we’ll reserve judgment. Pssst, go ahead and consider a 2018. With model-year ’19 cars delayed and not expected to be materially different from the ’18s, taking advantage of deals on a 2018 6 is a canny move. Mazda isn’t known for heavily incentivizing its vehicles, so if you’re in the market for a midsize car, we have no qualms about recommending a 2018 Mazda 6. By way of background, this company’s marketing resources are more limited than those of many competitors, and its attention in early 2019 was on launching the redesigned version of the Mazda 3 compact car. It’s also devoting resources to the planned model-year-2021 addition of a new crossover to be built at a new factory in Alabama, in a joint venture with Toyota. As for the Mazda 6, expect the 2019 and 2020 models to retain the 2018’s lineup: base Sport, better-equipped Touring and Grand Touring, upscale Grand Touring Reserve, and everything-but-the-kitchen-sink Signature. All will continue with a four-cylinder engine – turbocharged on the Grand Touring and Signature models – and, we hope, with a rarity nowadays: a manual transmission available for the Sport. Unlikely, and that’s fine. 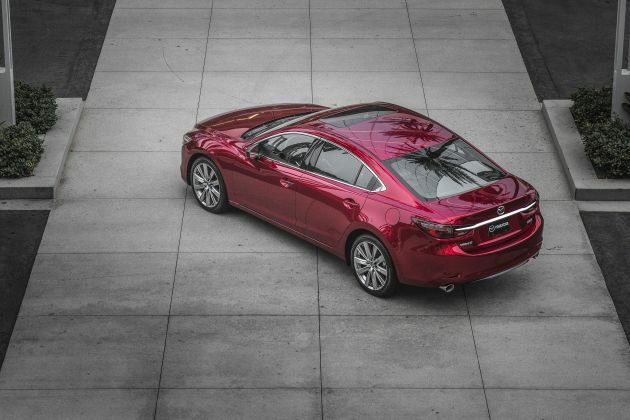 The 2018 freshening refined the 2014-2017 Mazda 6’s already gorgeous lines. It received a bolder grille, reshaped headlights, and a more toned rear end. Even with the flood of redesigned midsize cars appearing for the 2018 and 2019 model years, the 6 remains head and shoulders above the competition for exterior design. Inside, the ’18 freshening brought a more user-friendly control interface and upgraded cabin materials. The flagship Signature stands out with supple Nappa leather upholstery and suede and genuine wood trim across the dashboard and door panels. Even the “Deep Chestnut” (aka Brown) interior looks good, something not every modern car can manage. Mazda restored touch recognition to the car’s standard infotainment screen for 2018. This a convenient adjunct to navigating the interface solely through the admittedly well-designed console-mounted joystick and surrounding buttons. Happily, all 2019 and 2020 Mazda 6 models should include Apple CarPlay and Google Android Auto. Early-production 2018 cars did not support those smartphone interfaces, though Mazda supplied dealers with no-cost retrofitting kits to add them to Touring and above trim levels. The upgrade takes roughly two hours, requiring installation of new hardware in addition to the software. In keeping with Mazda’s zoom-zoom approach, the sedan’s front bucket seats are generally well suited for comfort or performance driving. However, folks of wide beam should be advised that the seats’ prominent side bolsters might feel confining. In back, headroom and legroom don’t quite match that of most rivals, although the rear seat is far from uncomfortable. Trunk volume of 14.7 cubic feet is slightly below average for the class. Interior storage isn’t great either, mostly because of the small center console box. Very unlikely. Expect 2020 Mazda 6 Sport and Touring grades to return with a naturally aspirated 2.5-liter four-cylinder engine producing 187 horsepower and 186 pound-feet of torque. Those ratings would remain competitive with other midsize sedans’ base engines. And acceleration would continue to be adequate, with decent jump from a stop, but little in reserve for aggressive higher-speed passing or merging. Matching a feature available elsewhere in this class only on the Honda Accord, Mazda will likely continue to offer the Sport with 6-speed manual transmission as standard. It’s a nod to enthusiast drivers that we appreciate. Optional on the Sport and standard on the Touring would be a 6-speed automatic transmission. It’s a good match for their 2.5-liter engine, and is competitive with the 8-, 9-, and even 10-speed automatics of some rivals. Expect 2020 Mazda 6 Grand Touring, Reserve, and Signature models to continue with turbocharged 2.5-liter four-cylinder of 250 horsepower and 310 pound-feet of torque. It should again pair exclusively with a 6-speed automatic transmission. Turbo engine addresses our largest reservation about the 6: the shortage of power from the non-turbo engine in the Sport and Touring. In a class were the lion’s share of turbo fours displace 2.0 liters, our Mazda 6 Signature review samples tapped the slight edge provided by their larger 2.5-liter to erase most traces of turbo lag away from a stop. They felt lively on takeoff and delivered smooth, strong acceleration thereafter. Tempering our mood was the transmission’s occasionally delayed downshifts when more power was needed for high-speed merging and passing. Manual overrides via steering-wheel paddles or the console shifter helped, though this engine pines for at least two more gears to really get the most out of it. Road manners overall are at the top of the segment and reason alone to consider a Mazda 6. All models handle with confidence. Steering feel, grip, and balance are first rate. Refinement also rates highly, with neither engine producing untoward noise. Tire and wind rush are also kept well in check. Very unlikely, absent unanticipated changes to engines or transmissions. 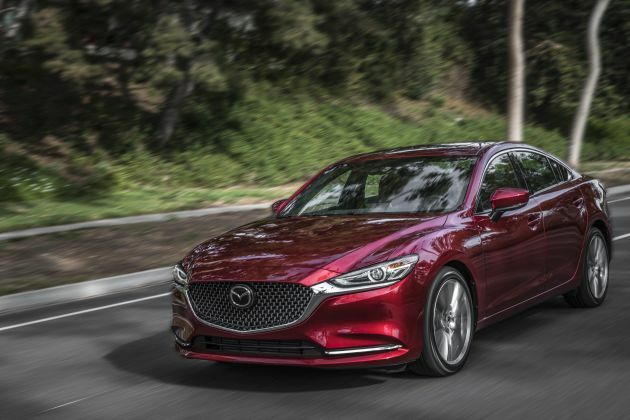 EPA ratings for the 2019 Mazda 6 were not released in time for this review but it’s safe to assume the 2018 ratings will carry through until there is a powertrain change. Expect the 2020 Mazda 6 Sport with manual transmission to rate 24/33/27 mpg city/highway/combined and the Sport and Touring with automatic transmission to rate 26/35/29. Look for the turbocharged 2020 Grand Touring, Reserve, and Signature models to rate 23/31/26 mpg. Our Signature test car returned 26.5 mpg in suburban commuting. Note that the non-turbo engine uses regular-grade, 87-octane gasoline. Mazda recommends premium-grade 91-octane for the turbo. Regular can be used with the turbo, but Mazda says horsepower will drop to 227, from 250. Probably not, but given the delayed 2019 model, only Mazda knows precisely how it might alter the 6’s feature set over the near term. It could, for example, make a complete suite of driver-assistance features standard on all 2020 Mazda 6s. On the 2018 6, safety tech such as adaptive radar cruise control, lane-departure warning with automatic steering correction, automatic high-beam headlights, and high-speed autonomous emergency braking were optional on the automatic-transmission Sport and standard otherwise. None of these items was available on the manual-transmission Sport. Likely returning as standard on all ’20 Mazda 6 models are full LED exterior lights, dual-zone automatic climate control, pushbutton engine start, blind-spot alert with rear cross-traffic detection, automatic emergency braking that works at speeds up to 19 mph, and 8-inch touchscreen infotainment with CarPlay and Android Auto. In addition to the above-mentioned driver assists, Touring grades would add 19-inch wheels (up from standard 17s), leatherette upholstery, power driver’s seat, heated front seats, power sunroof, keyless access, and extra USB charging ports including two for rear-seat passengers. Grand Tourings would continue to gain the turbocharged engine, auto-dimming mirror on the driver’s side, Bose-brand audio system, and imbedded GPS navigation. The 2020 Grand Touring Reserve would likely again add specific wheels and exterior trim, windshield-wiper de-icer, leather upholstery, power front-passenger seat, driver-seat memory, ventilated front seats, heated outboard rear seats, head-up instrument display, and steering-linked headlights. Signature grades will continue with a unique grille, heated steering wheel, Nappa leather seating surfaces, suede and genuine wood interior trim, surround-view camera, and front- and rear-obstacle detection. They’ll probably be higher than those of the 2018 and 2019 models, but probably not by too much, given few expected upgrades and slipping demand. Our base-price estimates include manufacturer destination fee, which was $895 on the 2018 Mazda 6. Estimated base price for the 2020 Mazda 6 Sport with manual transmission is about $23,500, with the automatic transmission adding $1,000. Expect the ’20 Touring to start around $27,500. Among turbo models, estimated base price for the ’20 Grand Touring is around $31,000, for the Grand Touring Reserve about $33,500, and for the Signature around $36,500. Mazda probably will continue to charge another $200-$600 for select paint colors. If it doesn’t make driver aids standard on the automatic-transmission Sport, they should continue to be part of the i-Activsense Package, which was $625 on the 2018 version. All other extra-cost items will likely come in the form of dealer-installed functional and dress-up accessories. With the 2019 Mazda 6 release date in spring 2019, it’s unlikely you’ll see the 2020 appear before the end of calendar ‘19.